Brrr! It’s pretty cold outside. In fact, there is a winter storm warning in effect. Wheeeee! Now, don’t get me wrong. I don’t love that when it snows in Western Washington people forget how to drive and just generally turn into total freaks, but I do love it when the community is forced to slow down and just take life as it comes. I wish every day were a little more easygoing, don’t you? On a completely unrelated note, I could go for some sushi right now. 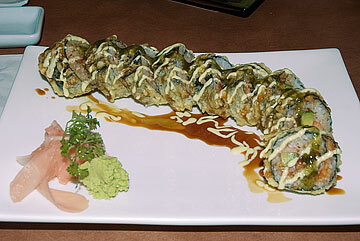 This is a photo of my favorite type of sushi: the Las Vegas Roll. I think it’s my favorite because it’s partially deep fried. All the other stuff inside is good, too…whatever it is. Well, my friends, wonder no more. Best before 04/11? Better get eatin’! Catch of the Day’s Pollock Skin Twists and Sushi with Sweet Potato is two treats in one. You can’t Photoshop those fish scales! This may be the best we’ve seen yet! How do Catch of the Day’s Pollock Skin Twists and Sushi with Sweet Potato treats stack up? 1. Price – We paid $5.99 for this 5 oz bag. No complaints there. 2. Quality – These treats are made in the United States. At least part of the ingredients come from Argentina (as well as the U.S.). 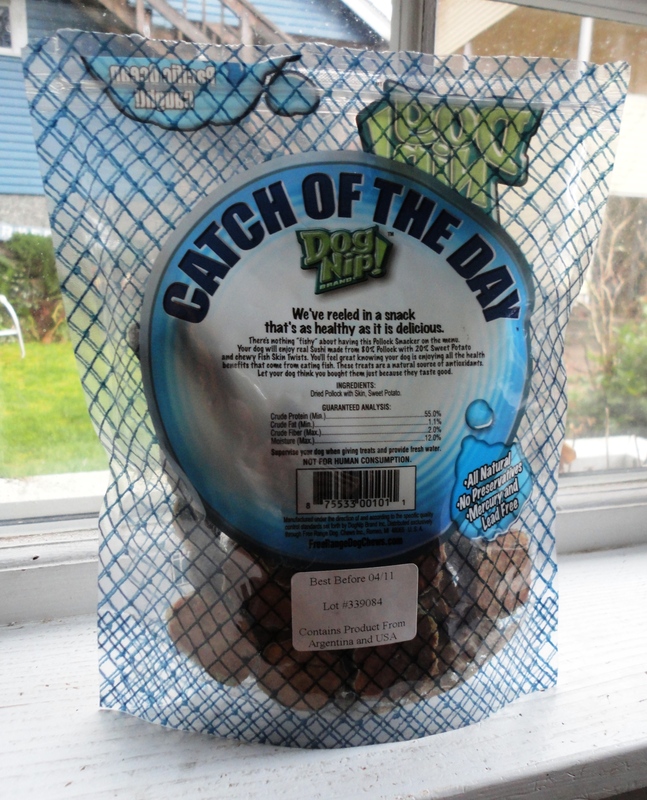 Catch of the Day treats are mercury and lead free! 3. Benefits – The ingredients bring a whole lotta benefits to the table (see below). 4. Ingredients – Sweet potato is a great source of beta-carotene (an antioxidant that reduces all sorts of icky diseases and health problems) and potassium. 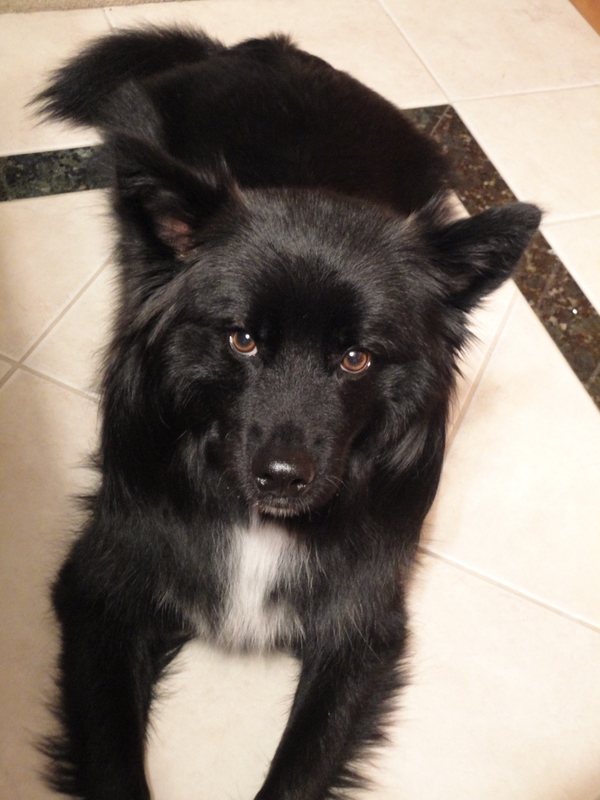 Pollock (and other types of fish) is a great alternative for dogs who are allergic to beef, wheat, etc. 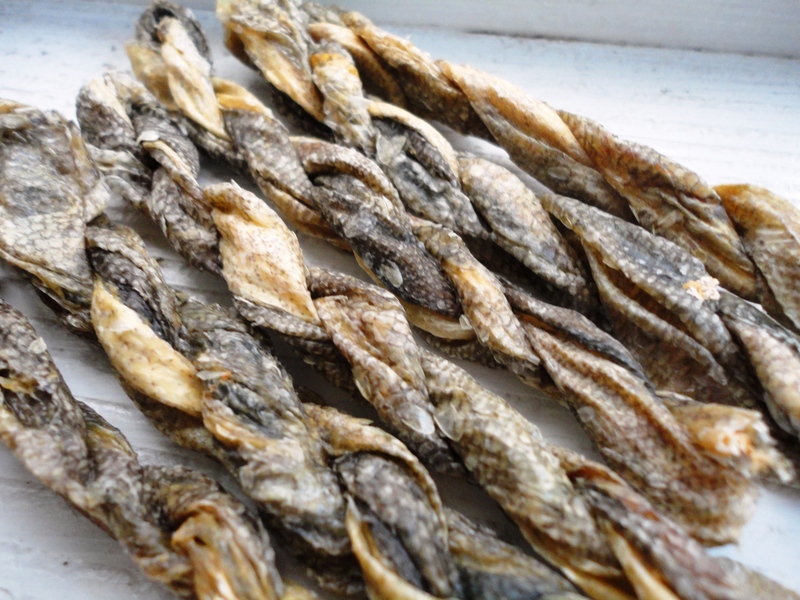 It is a good source of omega-3 and omega-6 fatty acids, which help boost the immune system. 5. T-Factor – Ok, so fishy treats stink. 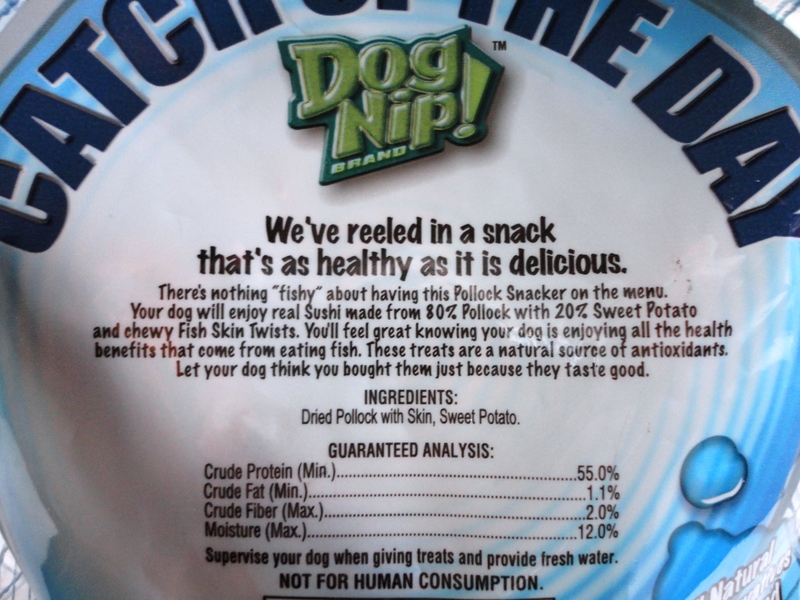 But if your dog is anything like Teton, their reaction to fish-based treats will make it worth the stank. 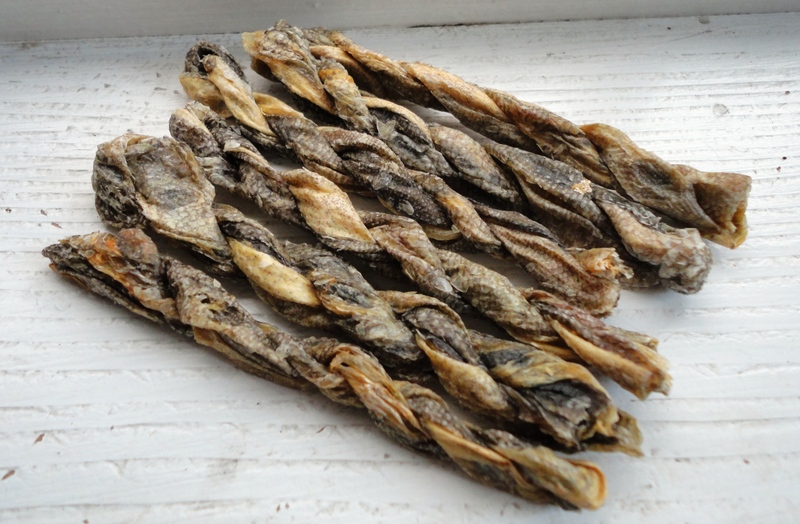 TLB adores fish treats, and these are no exception. Honestly, once you close the treat bag it’s not so bad. 6. Uniqueness/Fun – We think it’s pretty unique and fun that we get two very different treats for the price of one with Catch of the Day’s Pollock Skin Twists and Sushi with Sweet Potato. Keepin’ things interesting! 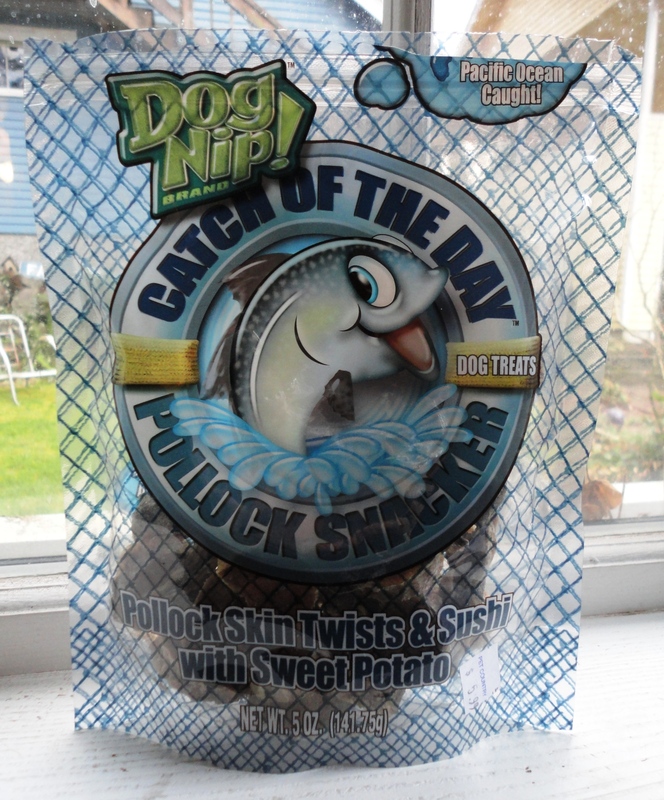 Fish-based treats like this one used to be a lot less common a few years ago. Still, it can be hard to find one that is inexpensive and chalk-full of good, healthy, simple ingredients. Catch of the Day’s Pollock Skin Twists and Sushi with Sweet Potato treats meets all of Her Dog Blog’s criteria for a great treat. We give ’em a solid eight out of 10. 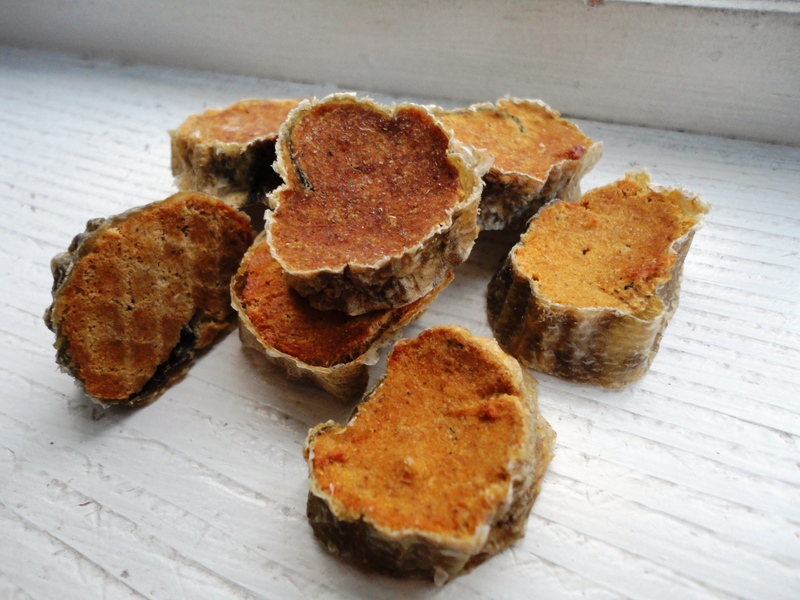 For more information on Catch of the Day, check out Free Range Dog Chews’ site. Posted on February 22, 2011 May 14, 2011 by Shannon	This entry was posted in Treat Jar. Bookmark the permalink.